Restaurants with catering capabilities especially can benefit from the addition of portable cookware, although brick-and-mortar establishments can also reap the benefits of cooktops that can be stowed away if not used often. Hot plates, warming plates, and portable induction cookers are all great options for cooking foods on-site at a catering venue or warming food items on-site. Gas-fueled hot plates utilize burners and portable cartridges while electric hot plates connect to an electrical outlet and use a flat plate surface for cooking and warming foods. Disposable butane cartridges allow for portability of gas-fueled hot plates. With a spark igniter and a burn time of around 1.5 hours, they’re perfect for many short-lived catering operations. 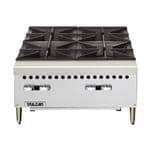 Light saute work is the name of the game, and the size ranges from 1-8 burners or 12-54 inches in width. Warming Plates are available without the need for disposable gas cartridges, making for a quick and easy setup where electrical outlets are available. Similarly, there are electric versions of hot plates available with a flat plate surface rather than an open burner. 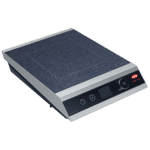 Electric hot plates with heating elements coiled into a burner use about 1,000 to 1,100 watts of power while a cast iron electric hot plate uses about 1,300 to 1,500 watts and heats up considerably faster. Electrical outlets require 110 to 120 volts for some models and 220 to 240 for others. These low-heat hot plates use magnetic waves to heat a specialized iron pot or pan. Omelets, saute work, or flambe can all be accomplished with an induction cooker. Induction heating works twice as fast as standard electric and propane or gas models. Electrical outlets require 110 to 120 volts for some models and 220 for others, and these burners range in wattage from 400 to 6000 watts of power and a variety of widths/burners. Durable materials comprising the cooktop surface itself can determine the speed of heating as well as how evenly the surface transfers heat. Cast iron is a common material that is both durable and heavy, and gas burners will use removable metal grating as well that will need to be cleaned regularly. Die-cast metal typically takes longer to heat up than other metallic surfaces, but it also holds the heat well. Exposed electric coils are typically covered with another metal surface, and these coils tend to take a few minutes to heat up and then cool down. A durable favorite, some models may have a flat stainless steel cooking surface. Stainless steel is easy to clean and quick to heat up. 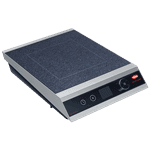 Used for portable induction cooktops with the heating element below, tempered glass heats up very quickly and cooks food faster than standard hot plates with conventional elements. Drip Pan: removable pan inserts can be placed beneath burners for easy, quick cleaning. Power Indicator: Some models with a power indicator light will shut the light ‘off’ when the burner has reached the proper temperature. Power Switch: while some models automatically turn on when plugged in or connected to a gas cartridge, others will utilize a power switch to allow for the unit to stay connected without being ‘on’ constantly. Expect multiple switches for multiple burners. Temperature Setting: whether simpler (low, medium, high) or more complex (exact temperatures), temperature settings can help reduce food waste and improve cooking efficiency. Non-Skid Pads: some models come with non-skid coatings on the bottom to help reduce the risk of the unit sliding across a surface top. Safety: without an open flame and without a hot cooking surface, the induction range is safer than its counterparts. Also, these burners are wheelchair accessible because the user can pull right up to the range with legs underneath the counter and also extend their reach over the range. Efficiency: power is transferred directly to the cooking vessel, ensuring that no energy is lost in the process. The range detects when and where a pan is placed as well as how large the pan itself is, so you aren’t using too much or too little energy to heat the product. 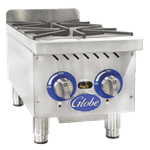 It has the precision of a gas burner without the open flame and without the immense input required of a gas burner. Less energy is lost ambiance, making it the most efficient of cooking ranges. According to the S. Department of Energy, the efficiency of energy transfer for an induction cooker is 84%, versus 74% for a smooth-top non-induction electrical unit, for an approximate 12% saving in energy for the same amount of heat transfer. Rapid Heating: similar to a coil, induction burners provide quick, rapid heating. The bonus is that the heating is directed only at pans and pots that are placed on the range. Cleanup: when foods spill over pans, they don’t burn to the range itself. This makes for easier cleanup at the end of the day, as you aren’t scrubbing scalded products off the range!